When I imagine a group of young kids playing a game of soccer, an image comes into my mind of a comet – a bright solid object trailed by a long tail of dust and debris. In the soccer game, the ball is the solid object, and a chaotic mob of chasing players forms the tail. 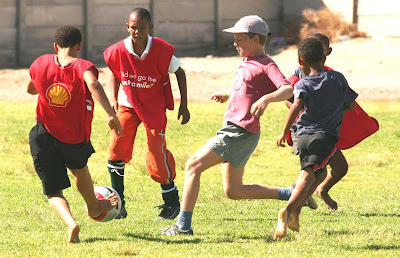 I was very impressed, then, at the Human Rights Day soccer tournament, held at the Odendaal Sports Fields on Wednesday, 21 March, to observe how soccer-aware and disciplined even the youngest players were. True, the younger age groups who played early in the day occasionally adopted the comet strategy, but in general, the soccer was of a high standard and, as my father’s Boy Scout Log-book was apt to say, a Good Time was had by all. The tournament, initiated by Jakoba Visagie and Goliath “Tool” Lottering, was envisaged as a way of bringing the two sides of Prince Albert together in a celebration of the common humanity that is the essence of Human Rights Day. North End was very well represented, and the upper part of town rather sparsely so. However, the games themselves, particularly the early less formal ones, were conducted in a spirit of perfect togetherness. The later games, between established youth teams, were very impressive in their skill and discipline. I do not know the names and other details of the more senior teams involved in the tournament, but it is very heartening, for a soccer-lover like myself, living in a part of the world that has a far greater awareness of and passion for rugby, to see the Beautiful Game given the amount of respect and devotion that was evident that day at the Odendaal Sports Field. Innumerable informal games of “one-bounce” and the like, the specific rules of which escape me, were taking place on the sidelines and on the stoep of the club house, providing a graphic demonstration of how soccer skills and artistry are developed, even in communities with fewer resources – in fact, particularly in such communities. Soccer is genuinely a game that anyone can play, anywhere. Rudi Maeyer provided an excellent example of rising to the occasion when he was strong-armed into refereeing one of the junior games, something he had never done before. Fortunately, there were no television replays for sideline commentators to second-guess his decisions, and everyone was having way too good a time to suggest that he needed some specs. Finally, I was most impressed at how many thirsty players (and hangers-on) can have their thirst quenched by a single watermelon! The three that were cut up during the course of the morning put one in mind of loaves and fishes.